The Senior Connection's Festival of Trees is celebrating 13 years as the center's biggest fundraising event of the year. Proceeds from the benefit are vital to support seniors living in their own home and the center's Wheels on Meals program. Most important and exciting this year is that the entire event is at the Senior Connection in Hailey for the first time. "It's very exciting to bring the event home," said Senior Connection Executive Director Kim Coonis. "This a step forward because our building is beautiful." 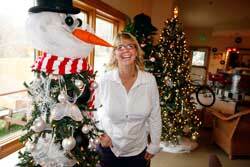 The 13th annual Festival of Trees will begin today, Dec. 1, from 11 a.m. to 6 p.m. with a Christmas Shopping Affair. On Friday, Dec. 3, from 11:30 a.m. to 1:30 p.m., the Panache Fashion Show Luncheon will take place and on Saturday, Dec. 4, from 6-9 p.m. is the Festival of Trees Gala. Tickets for the luncheon are $30 and tickets for the gala are $50. Coonis said the gala will have cocktails and food prepared by the Senior Connection chef, whom she said is incredible. The trees range in price from $200 to $2,000. "It's more than just trees for sale," Coonis said. "There are gift certificates, wild bird live trees and a tumbleweed tree." Coonis is very excited that anyone who purchases a tree can take it after the gala or have it delivered. Delivery is included with a purchase of a tree. The Senior Connection has about 600 members who use the center for a variety of reasons. The remodeled and expanded facility has a new fitness room and a resource library with a great deal of information on care giving. "Senior Connection is not just for old people," Coonis said. "It's for everyone. People come to lunch and help out. It is a wonderful environment to be in." Coonis said the Wood River Valley has extremely generous people who support the Senior Connection, but it takes a great deal of funding to run the center, which has a $1.3 million budget. "We get $35,000 from the state, and the rest of it we have to raise," she said. The gala event on Saturday will have heavy appetizers, cocktails, music and dancing. In addition, Zou 75's Rob and Kris Cronin will emcee the event, and a raffle drawing will include two $1,000 gift certificates for Atkinsons' Market. For details, call 788-3468.